Controlling My Chaos: Janet Got Her Blurb Blog Book! Last week I shared my published blog book on my blog, and several people have asked me to let them know how Janet's Blurb blog book turns out. Well, Janet stopped by to share it with me this week, and I'm happy to report that it looks great and was very economical. Especially compared to the heart palpitating amount I paid for mine. Janet's book is much thicker than mine as Blurb doesn't limit the number of pages. That is a huge selling point, in my opinion. When you want your whole blog for a year, you want your whole blog for a year. Am I right? Although you can't "slurp" Blogger blogs on Blurb anymore, you can do what Janet did, which is to copy and paste from her blog directly to her Blurb book, with a window open on the blog and a window open on Blurb. 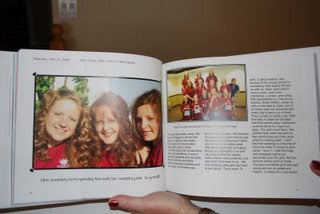 Looking through Janet's book, it was obvious that there were many template choices for pictures and text. Also, the book was printed very professionally and bound nicely. It came in a matte finish. 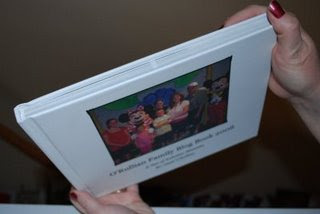 1) Her book is 8x10 in size, although 12x12 books are also an option. 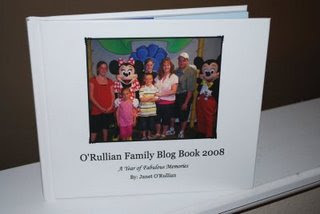 2) Janet's book is 180 pages, so she didn't have to cut out any pictures, which her blog is full of, and she got all of 2008 into it. 3) Janet uploaded her book to Blurb on January 28th, it was printed on January 30th, and she had it in her hands on February 5th. 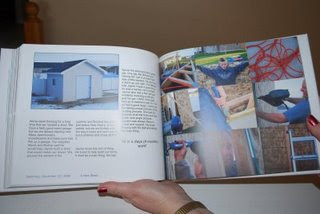 4) For Janet's 8x10 book, it cost her $69 . . . for a hardbound book including shipping and handling! Amazing. I am very impressed with the quality of book that Blurb produced, especially at that price. If you want to do one for yourself, go to Blurb and check it out. I'd like to take this opportunity to thank Janet for sharing her book and her experience with us. Thank you, Janet! You're the best! FYI - I just got a newsletter from Blurb saying they now can slurp from Blogger again (along with LiveJournal, WordPress, and TypePad. I did one book with Blurb before they stopped working with Blogger and it was very easy to do. And a lot of fun. Blurb is compatible with Blogger again..YEA!! I used to be a CM consultant...they have nice stuff, but I'm sorry to say, other companies usually beat CM's price on nearly everything, hands down. Especially stuff like photo books. I know you are trying to be good by using your own company, but that $261 or however you paid for that one was waaaaaaaaaayyyy too much, in my opinion! You represented me well. Thanks! Fabulous! I can't wait to make mine. I wanted to give you a heads up that you were nominated for Best Organizational Idea for your Printable Chore Charts on Tip Junkie. My readers are currently voting for their favorite and if you win, you’ll receive a fun prize. I was wondering if when you ladies upload pictures onto your blog, if you compress the size. I do so to conserve room, but now I am wondering if I ever wanted to make a little book like that, if the picture quality would be poor. Maybe on Blurp I can cut and paste my text from my blog and still use the noncompressed picture files too? I wandered over here from Tip Junkie and saw this post too. I just wanted to let you know that Blurb has fixed the problem and can now "slurp" from blogger again! yayyyyy! I AM SAVING IT TO MY HARD DRIVE.........and someday, maybe in like 5 years or something, I'm going to try to get it published in a real book..........where we can really make some money off of your sometimes sick sense of humor. Not that we'll get rich or anything, but you never know. At least all your education hasn't gone to waste!! You're just lucky that you had me as your older sister to look up to and mimick. You do know that's MY sense of humor you have! :) Anyways.......if you don't want me to save it to my hard drive, then that's just too bad!!! SUE ME!! Love you!